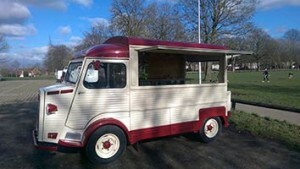 Our vintage Citroen HY van can easily be turned in to great looking mobile bar. Van is fitted with two fridges and commercial coffee machine. Ideal for any indoor or outdoor event to serve cold and hot drinks.